“Survive the Sound,” an online game that features cute little fish swimming for their lives, is back for a second year with some new additions, including free participation for students and teachers in the classroom. The basics of the game remain as I described them last year. You pick out a wacky cartoon steelhead and then receive daily reports as the fish makes its way through a perilous Puget Sound over a 12-day period. The journey starts May 7, and signups are now open. See Water Ways, April 29, 2017. As in real life, many fish will not make it to the ocean because of the effects of disease and pollution along with the constant risk of predation. But a few lucky steelhead will survive, and the winners will be recognized. Individuals join the game with a $25 donation to Long Live the Kings, which will use the money to further research, ecosystem restoration and education. This year, anyone can start a team and encourage others to participate, sharing the joy or heartbreak of the salmon migration. Prizes will be awarded to the winning teams. The game is based on the real-life travels of steelhead, which have been tracked using implanted acoustic transmitters. Some fish swim faster than others and some even reverse course. This year, participants will be able to watch the progress of all of the fish making the journey, according to Michael Schmidt of Long Live the Kings. Last year, more than 1,100 people joined the game, and organizers hope for even greater participation this year. If nothing else, you should check out the cartoon fish and the clever things they have to say by clicking on the individual steelhead in the “Survive the Sound” fish list. If you would like to learn more about the person who turned the concepts for these odd and wonderful fish into creative works of art, check out “Meet the Artist Behind Survive the Sound.” To see more of Jocelyn Li Langrand’s work, go to her website, her Instagram page or Facebook. Contaminated stormwater has been identified as the greatest threat to Puget Sound water quality, and state and federal governments are addressing the stormwater problem in numerous ways. I spotted the videos this past week while working on a blog post about how well local governments in the Puget Sound region are embracing stormwater regulations mandated by state and federal permits. See “Stormwater Report …,” Water Ways, Dec. 15. The first video on this page is a general introduction to the stormwater problem, based on the idea that it takes 15 minutes for pollution to reach a river. Two videos in the series are similar, although one includes more solutions. I’ve chosen the longer one, called “Video Two.” The third video discusses some basic solutions, while the last goes into more advanced treatments. Others can be found on the Drain Rangers Channel on YouTube. The story of how “Drain Rangers” became a full-fledged elementary school curriculum is explained in a paper written by Pacific Education Institute (PDF 15.1 mb). 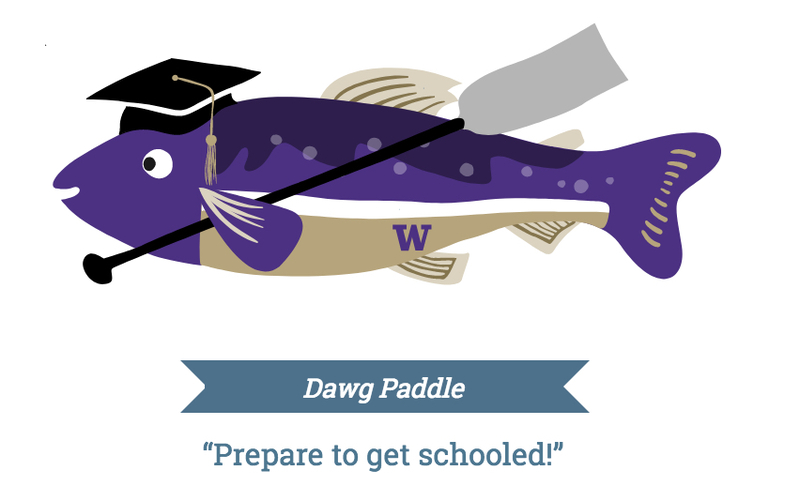 Outlines of the school programs can be found on the Puget Sound Starts Here website. The lessons are designed to meet state requirements for science, literacy and other educational standards. The curriculum addresses the problem of pollution as well as solutions. “This curriculum introduces students to a problem-solving model where they think like an engineer and explore ways to solve the problem of polluted stormwater runoff,” according to the final report (PDF 965 kb) on the project funded by the Washington Department of Ecology. According to the report, the grant project produced 15 teacher trainings, pilot projects in nine schools, four videos, six illustrations, 13 facts sheets and five posters. At least 34 schools signed up to implement the curriculum during the current school year, with about 70 schools expected to participate in 2018-19. A couple years ago, I was intrigued that a number of young women were making a living as professional mermaids. (See Water Ways, Jan. 27, 2014). Since then, the idea of becoming a mermaid for a day, a week or longer has caught on, with mermaid schools opening throughout the world. Crimson Resort and Spa in the Philippines claims to be the first mermaid school in the world, but others were soon behind. In New York, World of Swimming, a nonprofit corporation, inspires young people to become swimmers through lessons, swimming camps and other activities. The first short video on this page features young mermaid swimmers accompanied by music as they swim about by swishing their tails. In the second video (also below), ABC News reporter Sara Haines takes the plunge in a first-person report to see what it is like to become a mermaid. The piece made the airwaves on Good Morning America. In Vermont, reporter Sarah Tuff Dunn goes to mermaid school for the online publication “Seven Days” and is thoroughly enchanted after putting on her mermaid tail with its built-in swim fins. Sarah, who soon catches on to swimming like a dolphin, discusses the risks of drowning with one’s legs tied together, and she explains why mermaid schools tend to emphasize safety. What I find interesting about this mermaid trend is that children are getting excited about swimming. Being a mermaid or merman expands their confidence as they hold their breath under water for longer periods of time while building up their muscles for what could become a lifelong interest in aquatic sports — or at least some basic survival skills. For those who operate or would like to operate a mermaid school, there is a newly formed International Mermaid Swimmers Instructors Association. AquaMermaid or Aquasirene, Toronto, billed as Canada’s first mermaid school. YouTube video. FreeDive, UK, billed as the first mermaid school in Great Brittain. Mayim Mermaid Academy, South Coast, United Kingdom. Sirenas Mediterranean Academy, billed as Spain’s first school for mermaids, featured in the Wall Street Journal. A school play about climate change, featuring a worried mother polar bear and evil villains named “Mr. Carbon” and “Mr. Methane,” have captured the imaginations of elementary and junior-high-school students across the country. The program, called “Cool the Earth,” includes follow-up activities that encourage the young students to bring climate-saving ideas home with them. The first video on this page shows a play performed by teachers at Spring Valley Science School in San Francisco. I love the laughter of the children in the background. The second video shows an NBC News story from 2011. The “Cool the Earth” program was developed in 2007 by Carleen and Jeff Cullen, parents in Marin County, Calif., who became inspired to take action on climate change after viewing Al Gore’s documentary “An Inconvenient Truth.” Showing the film to others failed to gain the action they desired, so they expanded their horizons by developing an easy-to-understand message that could be shared with kids and their parents. Students then take home coupon books offering 20 ideas for no- or low-cost actions that they can do on their own or with their parents to earn points and sometimes prizes, such as earth-friendly trading cards. Carleen Cullen explains the program in the video below. This week, I’d like to share some student artwork from two contests. One is a local event in which 10 Kitsap County students are honored in the Kitsap Recycles Day contest, sponsored by Kitsap County Public Works. The other contest is for students anywhere in the country. Called the Keep the Sea Free of Debris contest, it is sponsored by the National Oceanic and Atmospheric Administration. 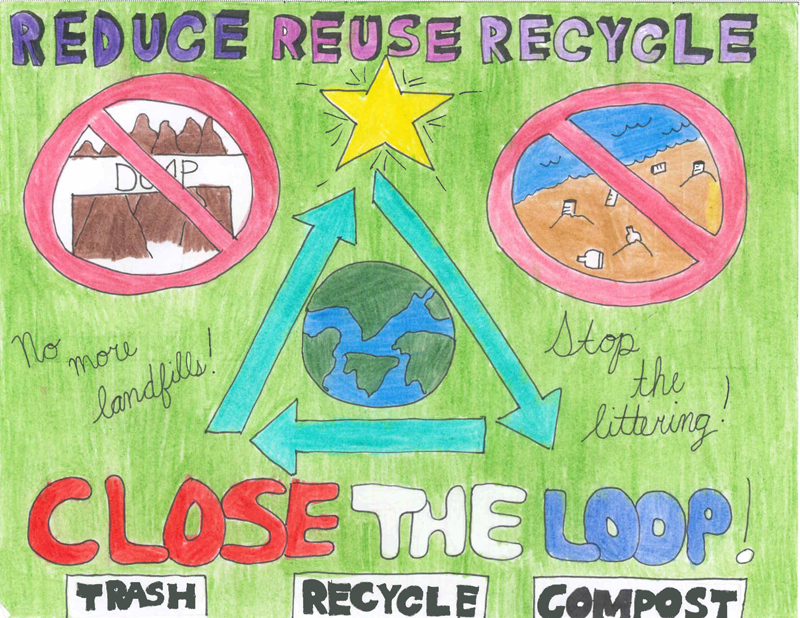 Li-Nelshin Co, a fifth grader at Esquire Hills Elementary School, created one of the winning posters for Kitsap Recycles Day. The first poster featured on this page is by Li-Nelshin Co, a fifth grader at Esquire Hills Elementary School, located in East Bremerton and part of the Central Kitsap School District. Other winning posters can be viewed on Kitsap Recycles Day webpage. A couple years ago, the Kitsap Recycles Day poster contest was moved from November to February and expanded into a broader educational program. The delayed contest allowed teachers and/or parents to provide more information than could have been completed by America Recycles Day, celebrated in November. A new activity book, “Close the Loop” (PDF 16.7 mb), is part of Kitsap’s expanded program. The other winners are Libby Parker, kindergartener at Gateway Christian Schools, Poulsbo; Natalie Oathout, first grader at Emerald Heights Elementary School; Jeddison Miller, second grader at Crosspoint Academy; Kelsey Derr, third grader at Hilder Pearson Elementary School; Saige Herwig, third grader at South Colby Elementary School; Charlotte Halbert, fourth grader at Gateway Christian Schools, Poulsbo; Blake Warner, fifth grader at Crosspoint Academy; Drew Moar, sixth grader at Manchester Elementary School; and Gia Acosta, eighth grader at Our Lady Star of the Sea Catholic School. The second poster on this page, a winner in the 2014 Keep the Sea Free of Debris contest, was drawn by Jessica D., a fourth grader in New York. The contest is sponsored by NOAA’s Marine Debris Program, which asked contest entrants to create their “vision” of marine debris. All 13 winners and their comments can be seen on a Gallery Page on the Marine Debris Blog. Students at Walton High School in Marietta, Calif., created the winning mural in the first “Water is Life” Classroom Mural and Art Challenge, sponsored by the Wyland Foundation. Winning entry from Northern Elementary School in Lexington, Ky.
Other top winners are Northern Elementary School in Lexington, Ky., in the kindergarten through fourth-grade category (teacher: Kimberly Vaca), and East Grand Middle School in Grandby, Colo., in the fifth- through eighth-grade category (teacher: Katrina Larson). Winning entry from East Grand Middle School in Grandby, Colo.
More than 9,000 students from 46 states reportedly participated in the contest exploring the human connections to water and emphasizing how water shapes the world. For individual winners and runners up, go to “2013 Classroom Mural Results” on Wyland Foundation’s website. The mural contest is being planned again, with entries to be submitted toward the end of this year, possibly a little earlier than last year. The Wyland Foundation, started by environmental artist Robert Wyland, is dedicated to helping people understand the importance of healthy oceans and waterways. The nonprofit foundation has worked with more than 1 million children since its inception in 1993. Efforts include public art programs, classroom science education and other events, including the National Mayor’s Challenge for Water Conservation. Bremerton was the 2013 winner of the water challenge in the category for cities with populations from 30,000 to 100,000. See Water Ways, May 3, 2013. If you’re wondering why this entry is a day late, it is because I had the day off yesterday with some technical issues in getting the information together. 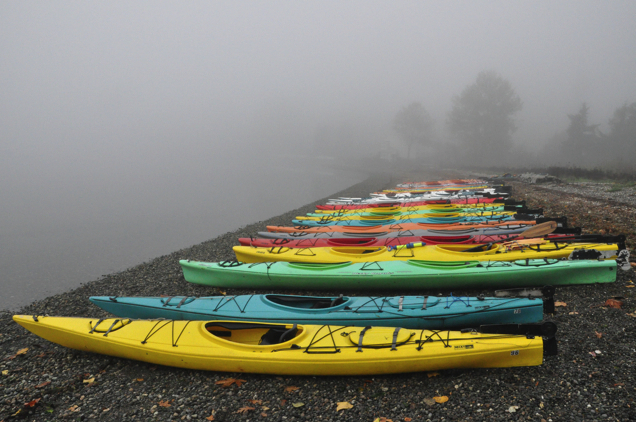 When 60 students from Central Kitsap High School took off in double kayaks to look for jumping salmon, they had no idea how the changing weather would make the trip more exciting. 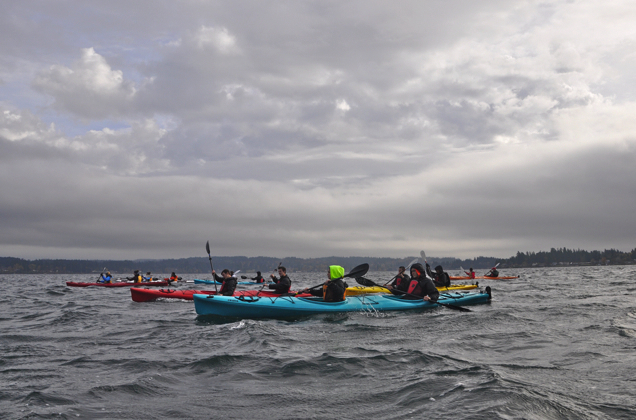 Bill Wilson, who teaches environmental science, organized Tuesday’s trip on Dyes Inlet near Silverdale. Lead guide Spring Courtright of Olympic Outdoor Center shares the story in her words. Reminder: Free stream tours from land are scheduled for Saturday. See the story I wrote for Tuesday’s Kitsap Sun. 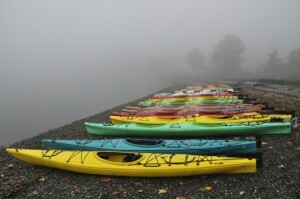 At 9 a.m. on election day, anyone peering through the fog at Silverdale Waterfront Park would have seen 35 bright kayaks lined up on the beach and 60 high school students preparing to paddle. Central Kitsap High School environmental science students study salmon in class, then are given the option to paddle with jumping salmon on an annual Salmon Kayak Tour with the Olympic Outdoor Center (OOC). For the last two years, 60 students have jumped on the opportunity. This trip started about 10 years ago with about half that number of students. I have been one of the lead guides for nearly all of these tours. It’s always an adventure, but this year was one of the more memorable trips because of the beautiful clouds and quick change in weather. Central Kitsap’s Salmon in the Classroom program been going on longer than the one sponsored by the Washington Department of Fish and Wildlife. So when I heard that the state’s Salmon in the Classroom program was being eliminated for budget reasons, I had a hunch that it might not affect Central Kitsap schools. “The program was too important to us to have it rely on the vagaries of state funding,” Tex Lewis told me for a story in today’s Kitsap Sun. 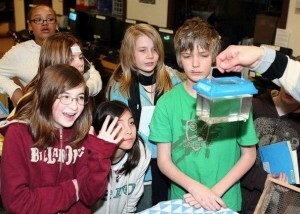 In March 2009, sixth-graders at Woodlands Elementary School observed a two-headed salmon hatched in an aquarium as part of the Salmon in the Classroom program. Reporter Susan Gilmore’s article in the Seattle Times described how the state was eliminating its Salmon in the Classroom program to save more than $200,000 a year for Fish and Wildlife. The program involves environmental education for an estimated 40,000 students each year, she reported. Paul Dorn, salmon recovery coordinator for the Suquamish Tribe, told me that the state’s program has supported a few aquariums in Kitsap County, and he hopes the tribe can pick up the cost for continuing and possibly expanding the program outside of Central Kitsap. Check out my story in the Kitsap Sun for details.